Well Home delivery is back and ON SALE too! 10% off all pork orders this week! it's our Winter Stock Up sale! Use the coupon code WinterStockUp in our online form to have it calculate the discount on your approximate total! It's a new form and hopefully it'll have fewer glitches than the last incarnation! Delivery is available to your home or for pick-up at the Winter Market at the 1912 Center this weekend! Market is 10am-2pm, home deliveries will start about 11am and no, you don't have to be home to receive your delivery. Spread the word and enjoy fresh farm products delivered directly to your home! Jason has done it again! Another creative success! This time, pork shoulder steaks and homegrown tomatoes along with garlic, some spices and home-made Thai dipping sauce have been turned into a fantastic fusion dish made to please the heat-loving as well as the mild-tongued in the family. 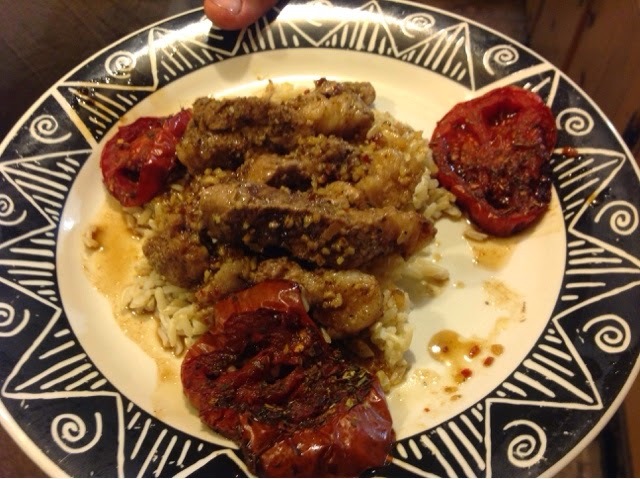 Splash balsamic vinegar over tomatoes and then sprinkle Italian seasoning generously across tomatoes. Bake tomatoes in one until soft through and beginning to caramelize. Defrost and debone shoulder steaks. When garlic is just beginning to be fragrant, add pork strips and brown on all sides. Generously sprinkle Italian seasonings over pork strips. Stir in about 1/4 tsp salt to bring out flavors. Add several gluts of balsamic vinegar to pan and about 1/4 cup of minced garlic in a pile to center of pan, cover and allow to steam for 5-10 minutes. When fully steamed, removed pork strips to a plate and cover. Reduce remaining pork sauce in pan and add in about 1/2 cup of Thai dipping sauce. On a plate, make a bed of rice, lay 6-8 strips of pork on top, spoon sauce over top as desired, place 3-4 tomato slices on the side and serve! As I hope you all know by now, Jason and I are expecting baby #3 this August. the 17th to be as exact as babies will be. It's a little boy this time and yes, his big sisters are extremely excited! Yes, I have been out working hard all season and you can all relax now as I have been banned from lifting heavy things in the last few months and having been blessed with multiple employees and interns, have been able to keep myself doing the easiest of jobs. I try not to do too much sheep chasing anymore. much. And yes, you will all have the opportunity to see, meet and/or hold the little one very soon after he arrives! Depending on when exactly he decides to make his grand entrance to the world and assuming that everything goes well of course, he'll be coming with us to the first market that I feel up to attending. Specifically for our CSA members and definitely for all of our regular customers, there will be some things affected, depending again on when exactly munchkin decides the time is to his liking. CSA shares will take a break for a week or we may do some sort of alternative. Keep your eyes on your email as we'll likely be notifying you by that method as to what exactly our alternative plan of choice will be. For our regular customers, We'll try to have our booth at all of the markets no matter what but if for some reason Omache Farm doesn't arrive to market, at least you can make a pretty good guess at what's going on! So at just about 2 1/2 weeks to go to the due date of Aug 17th, we are excited and busy preparing, hot and of course very tired. Keep your eye out at the markets for news and on Facebook. All of you lovely people are at the very top of our list to hear about our new little bundle of joy's arrival! So the newsletters simply haven't worked out as well this year as I was hoping they would. I'm sure all of you lovely folks will understand, given the circumstances. That all being the case, this seems the perfect time to put several updates down on paper. Well, digital paper anyhow. The biggest update is about the recent hail storm that passed through the area on Wednesday July 23. Hopefully most of you have had a chance to talk with Jason about it. He was getting our booth set up for the Wednesday market when it hit town and as our farm manager coordinated much of the acrobatics that ensued. There were several amazing folks that, upon hearing about yet another grand sheep escape that resulted from the hail storm, raced out to our farm to help put everyone back where they belonged. The most challenging loss resulting from this storm is likely our pumpkins and winter squash. 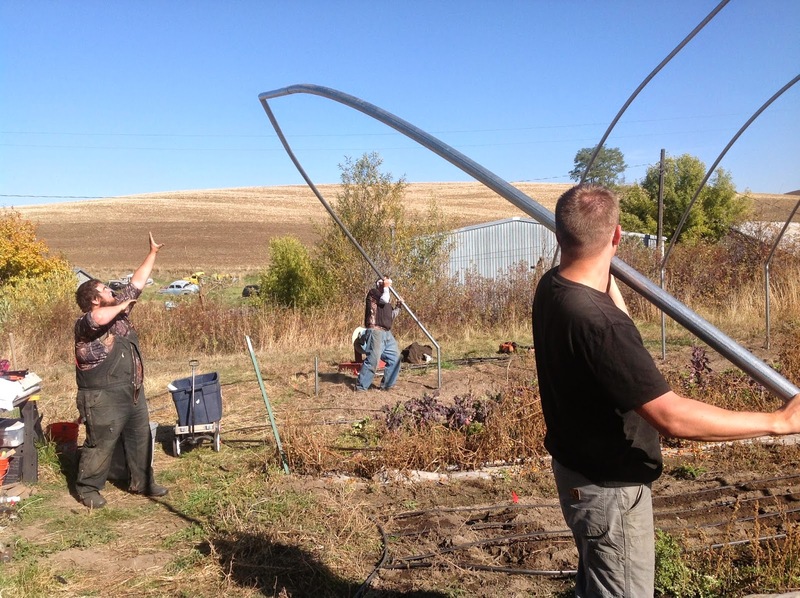 Being blessed with more acreage than many folks who grow veggies in the area, we were working on growing nearly an acre of pumpkins and another half acre of various winter squash varieties. The plants were very well established and while they have been growing back amazingly well the biggest question now is if they'll produce fully ripe fruits before the first frost. In just the last four seasons, we've seen first frosts come as early as mid September or as late as the end of October. Cross your fingers for luck for us! All of our CSA members came down to the market to pick up their CSA shares that day (impressive given the nasty weather) and upon hearing of the total devastation of our outdoor crops completely understood when we told them that it meant a pretty sparse CSA share for the next month or more until we could get fresh crops planted and for the survivors (kale, chard, Zucchini) to grow back and start producing once again. 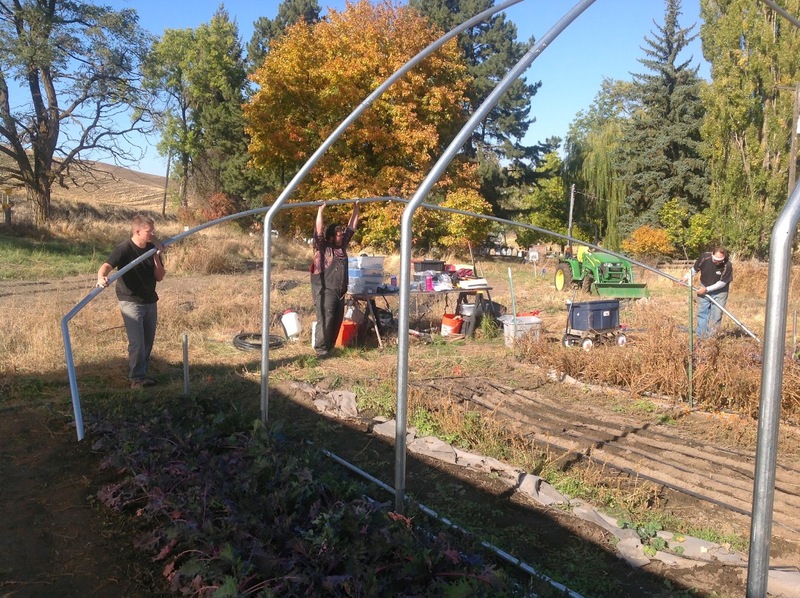 A huge thank you also goes out to Deep Roots Farm and Affinity Farm, both in Moscow. They have both donated a couple of different items to help us fill out our CSA shares this week. We cannot thank them enough! Keep an eye on Facebook for photo updates. Jason is hoping to take some photos of the recovery every week (Wednesdays or so usually) so we can all be absolutely amazed at the progress and amazing resiliency of Mother Nature. Believe me when I say I have been most impressed at how well things have been growing back. I've managed to post new photos into the Flickr album (there's a page tab, right next to the Facebook page tab) AND I've figured out how to make it so that the photos there are visible without needing to be a Flickr member or a member of that group. Lots of new photos on Shearing! Enjoy! Spinach is one of those lovely vegetables that is inexpensive, ubiquitous, really really good for you, and extremely versatile! Shall we break it down just a bit and give that huge-looking half-pound bag you just bought some ideas that make it suddenly not very much after all? The darker, the better. Especially within a bag or box or other group of spinach. Those are going to be the youngest, most nutritious leaves. If you are finding lots of yellow-green leaves, chances are the leaves were some of the older ones on the plant or that bag of spinach may have been on the shelf for a while. Frankly, it won't taste very good. Crispy and crunchy. The way to test? No, don't squish or pouf or otherwise abuse the bag of spinach. After that the only thing I can say is that it WAS crisp. This year presented even more challenges than usual. First, we had no barn. That means, I had no way to guarantee that the sheep would be dry come shearing day. One very good reason to wait until June to shear. The second large challenge to having no barn is that now, we had no partially set up facilities for collecting, holding and feeding sheep into the pen with Martin to be shorn: We had to build something. Luckily, we already have a stash of cattle panels and t-posts around for building various catch pens and loading chutes for sheep and pigs. It took us a little while to decide on a good place that was flat, close to the house for electricity and big enough to hold everyone but once we did building something proved relatively easy. The fun part came when it was time in the morning to collect everyone in the chute. While the majority of the sheep have been collected and shorn before, this particular setup was new (which equals extra skittishness) and there is always at least one extra skitter individual anyhow. Add in younger lambs who scatter when herded like an ant nest when you stab it with a large stick as well as the alpacas who simply despise shearing day and never go the way you want anyhow and you have a recipe for sheep anywhere but where you need them to be. Mix in one panel that wasn’t tied quite tightly enough and you get escaped unshorn sheep too. Stir it all together and you get lots of frustration, lots of laughs, luckily a good natured shearer, a great deal of learning and about 60 new fleeces that need new homes soon! For those of you that have been waiting, Custom orders are open for pork! We have about 3 hogs that'll be ready in the next 2-3 weeks for custom orders available. We also have custom hogs available that should be going in July and more hogs going sometime in August/September. Talk to us at the markets or email us about reserving a hog for your freezer! Potential Additions: Sprinkle the ham with brown sugar. Use the fats in the pan to liquefy the brown sugar. Or you might use maple syrup. Keep the temperature of your pan just hot enough to caramelize the sugar on the ham steaks but not burn the sugars! Frozen: Remove plastic and place in crock pot. Cook on low 6-8 hours, high 4-6 hours. Done at 165 degrees measured in the center of the ham, away from the bone. Thawed: Remove plastic wrap and place in crock pot. Cook on low 4-6 hours, high 3-4 hours. Done at 165 degrees measured at the center of the ham, away from the bone. Potential Additions: Many folks may consider tossing in a can of pineapple with the juice or studding the whole thawed ham with whole cloves. (the spice, not garlic cloves). For a hint of teriyaki style flavoring (Americanized of course) mix pineapple, pineapple juice (from canned pineapple, or add more plain pineapple juice, brown sugar and teriyaki sauce with the ham. Mix together Pineapple, juice, brown sugar and teriyaki sauce. Marinate thawed pork chops in sauce several hours to overnight in the fridge. Bring remaining marinade to a boil for use as sauce and serve all over rice. I typically use as much as 1 large can of diced or rings of pineapple per 2 adults. Add as much pineapple juice as needed to cover pork chops. Adjust brown sugar and teriyaki sauce to taste. Measurements are approximations as I usually use my nose to determine the right mixture. Melt butter in pan. Sautee onions until soft. Add radishes, stir until coated in butter. Add stock and honey. Cover and simmer 10 minutes. Remove cover; simmer until liquid thickens to glaze. Add salt as desired and serve warm. New Hoophouse (#3!) Is up! Since I need to learn how to cook lamb I thought I’d begin with the sirloin end of a leg of lamb which is the upper end near the hip joint. Most of ours weight between 1.5 and 2 lbs and all of them are bone-in. The bones make it challenging to de-bone but because it is the sirloin, it is more tender than the shank end of the leg. Because our lambs tend to be lean and have a light fat cover, we still recommend a moist cooking method such as roasting with liquid in the pan. I’ve found a recipe that promises both simplicity and mouth-watering goodness. 1 bone-in leg of lamb roast, half or whole. There should be some fat on the roast. A couple of teaspoons of herbs: some combination of thyme, oregano, rosemary, fresh or dried, or perhaps some Herbes de Provence. Remove lamb from refrigerator, uncover, and let sit at room temperature for 30 minutes to an hour. Preheat oven to 350 degrees with rack positioned to fit the lamb. In a large casserole that can go into the oven, heat up a little olive oil. Sprinkle the lamb with olive oil, salt, and pepper, and brown from all sides. Remove lamb from the pan to a platter and add the onion, carrot, celery and garlic. Cook over medium-low heat until the vegetables start to soften. Add the wine and scrape the bottom of the pan to remove any leftover brown flavorful bits. Mix in herbs and tomato product. Return the lamb to the roasting pan with any pan juices. Cover the pan. Cover the casserole and place in the oven. Cook for 20 to 30 minutes, reduce the oven temperature to 250 degrees, and roast for 3-4 hours. Remove pan from oven and increase oven temperature to 450. Transfer lamb to a plate and cover to keep warm. Remove the vegetables from the casserole with a slotted spoon and reserve them for the sauce. Strain cooking liquid into a fat separator or glass measuring cup; spoon off any fat that rises to the surface and discard. Spread a bit of olive oil on the bottom of your casserole, and return roast, uncovered to the hot oven. Make the sauce: combine the cooking liquid and reserved vegetables in a small saucepan and purée. Add a tablespoon of butter or heavy cream, if that’s the sort of cook you are. Keep sauce warm. When the lamb is crisped up and – if there’s a layer of fat on it – sizzling, remove it from the oven. Carve lamb and arrange slices on a large warm platter. Drizzle with sauce before serving, or serve the sauce on the side. If the whole carving thing is too elegant, place the meat, right in its casserole, on a trivet on the middle of the table, and have your family or guests remove hunks of meat from the roast with a pair of tongs. Yes, it’s that tender. Does your crock pot come apart into a base and a ceramic and glass lidded crock? Perfect! (If not, use an appropriately sized casserole and foil as described in the recipe and transfer between oven and pre-heated crock-pot quickly.) Use the crock as your casserole dish. The lid substitutes for the foil cover. After the initial roasting, move the crockpot out of the oven and onto it’s regular base. Set it to high and come back in about 4 hours or when it is nearly as done as you like it. In our case and as most recommend, keep lamb somewhere between rare and medium done-ness. When you are close to that point, pick back up with the recipe by getting your oven heated to 450 and leave the lid off. Lambs are HERE! Did I say that already? Oh well, there were a handful showing up last week but this week seems to be THE week for dropping little lambs. We’ve even had a rather amazing group of them! Jacobs, being a smaller, heritage breed of sheep, are not known for having more than one lamb each season. They can, however ewes who regularly drop twins are comparatively rare. Larger, more commercialized breeds of sheep, such as Rambouillet or Suffolks have twins and even triplets as a matter of routine. One of our lovely Jacobs, gave birth to not just twins but triplets on Sunday! Two little girls and a little boy, all with plenty of spots. One of the girls, the tiniest of the three, we decided to make into a bottle lamb. If we still had our barn or another place where we can pen them up and keep a much closer eye on mama and babies, I would have loved to allow her to keep all three for a few days to see if she really could raise all three. In the interest of the welfare of the smallest lamb, she is now living in our house and for the most part, is relatively quiet as long as she has company. Whether it is one of us, the children or the dogs, she doesn’t much care. So far she has been eating enthusiastically and growing well for starting out at only three pounds or so at birth. Her siblings are outside with their mother and also doing well. All of the lambs are growing fast and stretching their springs. One of the older rambouillets has already made it to 16 pounds! Granted, they usually weigh in at around 8lbs at birth so far. They are adorable to watch spring around the pasture playing while their mothers rest or eat. Hopefully, I’ll have a chance to take some photos before next week’s newsletter! Our newest hoophouse that you have all been hearing about will be ready for its covering on Sunday, June 1st at 10am! We will need all the help we can get to maneuver 4,500 square feet of plastic into proper alignment! Anyone and everyone are welcome to come out and assist! 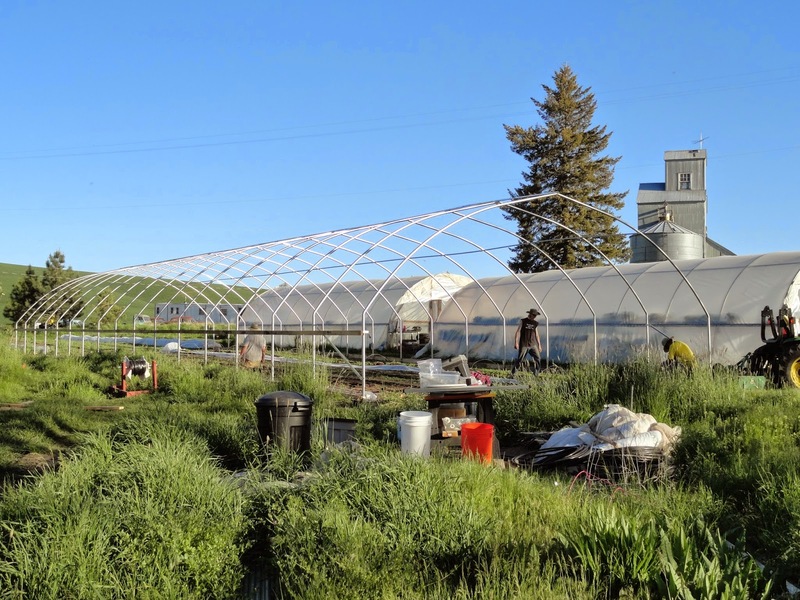 Much like an old-fashioned barn raising, we’ll all work together to get the hoophouse covered and then there will be food to celebrate the fact that we didn’t get to see a huge sheet of plastic floating its way across the Palouse. Please come on out at 10am on Sunday June 1st, bring a small dish to share, Omache Farm will provide meat. After the hoophouse plastic is in place, we'll enjoy good food, good company and a farm walkabout. You can see where we grow your food! No experience of any sort will be necessary, even older children can help. (Our children will eagerly and happily show off their best farm hiding places to children too small to help.) We would love it if you could set aside part of Sunday, June 1st to come out to the farm and participate in the growth of our farm! All the hoops are up! First purlin in the works. Needs just one more purlin and the hipboard on the far side. Just about ready for plastic! It would seem that a great place to start with ideas for your CSA veggies and fresh veggies in general would be with Salad Mix. It has become a household staple. An easy way to eat at least some of the vegetables you need to eat each day and a type of vegetable with which you can quite literally please everyone. A popular staple in our house is salad. I’m sure everyone already has their old standby favorites but I thought I’d add one more that you can add to your repertoire for the season! Store in refrigerator. Allow time to come to room temperature or microwave just until re-liquified before serving as the olive oil will solidify in the refrigerator. Chop walnuts finely and add to dressing. Flavors will be best when given time in the refrigerator. Add rinsed and dried ripe berries right to your jar and shake well. The berries should break up. Give time in the refrigerator for best flavor. Raspberry walnut is a classic combination. Can’t go wrong here! Nuts: I usually keep sunflower seeds in the pantry but Walnuts or almonds are great as well. Not a big vinaigrette fan? Need something else for just the right flavor? Our other favorite around here is Goddess dressing. The grownups have to hurry when salad is served and there’s only just enough Goddess on the table or the munchkins will hog all of whatever is left! On Sunday, our sheep FINALLY began to lamb! As of yesterday, we had three beautiful Jacob lambs and one Rambouillet lamb. So far, pretty good, especially on pasture. On Monday, Genny, one of our Interns, and I, Margaret, went out to fence fresh grass for all of our lovely ruminants. If they could have only waited five more minutes for us to finish the last of the new fence, we’d have needed to earn our exercise elsewhere this week. But no! They had decided that they were apparently hungry enough that they had to simply try to reach fresh grass by sticking a head between a post for the electric fence and a post for the woven wire fence which of course popped the electric connector off the hotwire above the woven wire fence to create a lovely new gate. Out they ALL go. Well, except for the three Jacob mamas. They decided to stay and let their babies hunker down instead of go adventuring. Off they go, gobbling as fast as possible and walking up towards the road and away from the new area into which they were SUPPOSED to go. Genny and I drop what we're doing and race to try and get around the sheep and attempt to bring them back. Whether they go back into the old area or the new we don't care as long as they are in some area with a fence. We manage to get them back to the corner where they escaped, albeit on the other side of the woven wire fence and just as the sheep are thinking about heading into a fenced area, the Alpacas decide that can't be right and take everyone off in the other direction through our neighbor's field of peas. Genny is on that end of the sheep so I send her to attempt to get in front of them. The alpacas have done this game before and decide to keep up the pace and keep going. They traveled all the way down the field, nearly to our distant ponds before a turn in the hills caused the alpacas (and entourage) to pause and think long enough for Genny to catch up with them and attempt to send them back the way they came. Instead of going into their newly prepared fence, for which I was attempting to create an entrance gate, they took off back up the pea field back towards our winter wheat. When they got there, the Alpacas decided that wasn't right so they kept going and took everyone up to the road and towards the veggies and our landlord's house. Of course, Genny and I are now BOTH behind everyone. without a speedy dog, there was absolutely zero turning them around at this point. Our only saving grace was the fact that Ronn, our other intern, Dave, and our employee, Dan, were down in that field transplanting green onions. Dan happened to look up and see sheep. Ronn turned around expecting to see a few renegade creatures and instead, they saw the ENTIRE FLOCK. Thank goodness they were there because they were able to help us get them turned around and walking down the access road and back towards their original enclosure. Now that they'd managed to gobble enough to sate their crazy appetites and were back to simply starving (likely from all that running now...) they were content to walk in a group down the access road and back into their fenced area. Once they were in, it took us about 5 minutes to finish setting the new fence. Dan and Dave herded the sheep from their old area into their new and as soon as they saw the fresh new grass, they were happy once again. And we decided that it was lunch time. Easter Eggs, Ham, and Lamb! Have you bought enough eggs for decorating? Do you still like making egg salad even though you don't have kiddos around this year? Is your family an Easter Ham or Easter Lamb type? No matter what, we've got you covered! Don't want to buy a whole $25 worth of eggs? Check with your neighbor, perhaps they need a ham or a lamb leg roast or maybe they also need some eggs. Don't know what to do with all those eggs once you've boiled and decorated them? Check out the latest recipes and helpful tips we've posted: How to Boil an Egg and Margaret's Amazing Egg Salad. They're really easy, I promise! Do our eggs dye? Well, that's a good question. I've never heard of great results with brown eggs and the traditional food color and vinegar dyes. There are however two other ideas that you may find very fun and quite gorgeous! Stickers are always special but sometimes just don't have enough sticky. Coloring with crayons works pretty well too. Don't worry, you'll make egg salad with the broken ones from overly heavy hands, right? (although you've got to work pretty hard to break our egg shells! The best idea I think I've found for working with non-white eggs I've found yet will go especially well with all those pesky crayon pieces you've been stepping on... again. Take a look at Mama Smile's blog post about using them to decorate her eggs and at Mud Hut Mama's post about using the technique on brown eggs. Wonderful and inspirational photos on both posts! Okay I was just kidding. I do have some recipes that I'm pretty particular about but this isn't one of them. Can you hard boil an egg? OK, so I could hard boil an egg but I didn't really like them and wasn't ever really satisfied with the results of my endeavors. Somehow, when the yolk turns totally chalky and has a bit of a green tinge to the outside of the yolk, it just seemed like I must be doing something wrong. I was definitely overdoing it. Labels: boiled, cook, easter, egg, Eggs, farm, Fresh, hard boil, how to, old, Omache, pastured, recipe. Anybody need half a hog? Did you miss out on a chance to buy half a hog last fall? Now is your opportunity! We are short by a half with a group of hogs going in on Thursday, April 10th to C & L Locker Company. Since they are a custom facility, I cannot put the extra half into our retail stock. Nor can I simply keep a two-legged pig here. If you are interested, Please email OmacheFarm@gmail.com ASAP. If nobody else has called dibs, we'll let you know so you can go ahead and download, fill out, scan and return our cutting form. You have until Sunday, April 13! Price is as follows: $100 for slaughter, cut and wrap (including curing ham and bacon) plus $3.25 per pound of hanging weight. (The weight of the carcass before it is cut and wrapped) The hanging weight should range from 55-75 lbs. 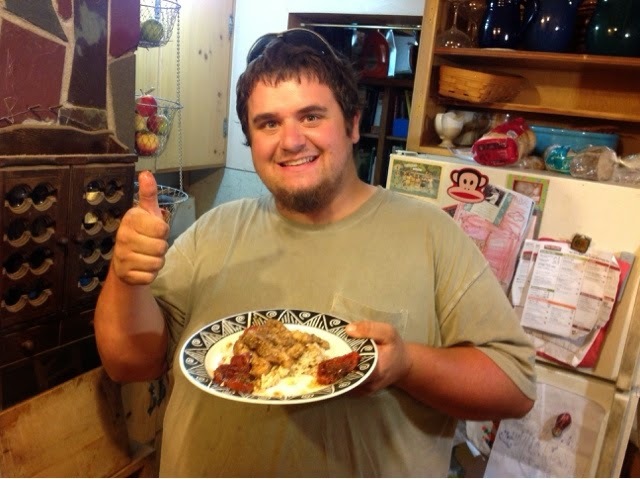 Read more about our pastured pork HERE. Download our cutting form HERE. From now through the first Thursday in May, Omache Farm is offering home delivery of our farm fresh products! Order right here, from our website and receive your order right at home! We are fortunate enough this spring to have product to sell. 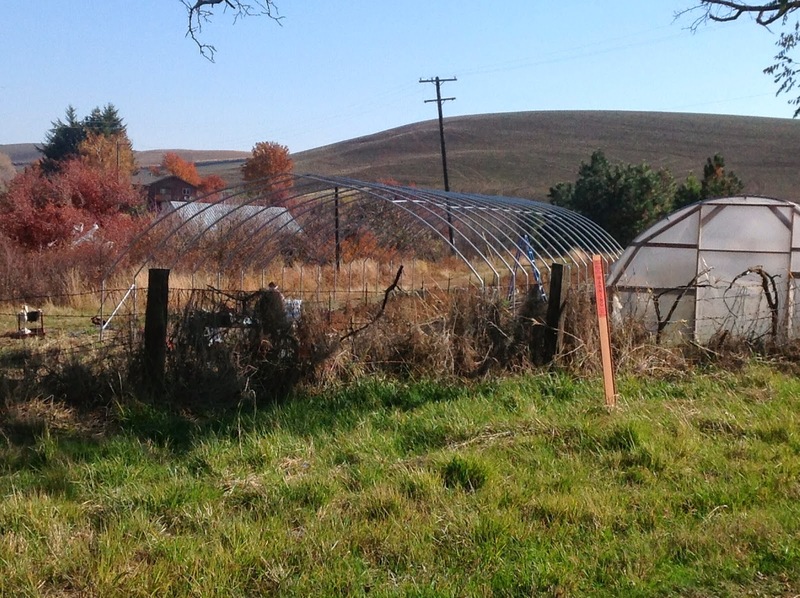 Unfortunately, there aren't any markets already set up in the early spring before most vegetable growers have produce. We decided to trial another new program. Hopefully with your enthusiastic support and patronage, we'll find the time and effort worthwhile. Just a few pictures to share about the funny relationships one builds with all the varied creatures that also call our farm "Home." The kitties taking a morning nap recently. How cute! There are two things on our farm on the palouse that signify spring is here. The first is the winds. They are always blowing... hard. they usually start in mid February and blow most of the way through March. The upside is that it starts being sunnier here when all the clouds get blown right past you. This morning dawned partly cloudy and surprisingly only mildly windy. Today was the first day that the sun peeked above the hills before HannaMae's bus arrived. The second thing that signifies spring on the palouse is restless sheep. Makes sense, right? No more snow covering the ground and things are starting to warm up and grow fresh green grass. WAAAAAY better than all that dusty dry straw they've been eating all winter. Grass, oat or alfalfa, it doesn't matter how much they've been spoiled or not because the fresh green stuff is always better than any type of hay. The ramboulliets apparently just whine. Baa, Baa, Baa. The Jacobs are too smart for that. They have learned that sometimes the people hide the good grass outside the fences. ometimes next to the red barn, sometimes over past the gardens. Sometimes the people even hide the grass up the road by Betty's house. The Jacobs have also learned that barbed wire, especially ancient falling down fence, doesn't hurt. Those fences are really more of a suggestion than a rule. The main reason those fences never have been fixed is because they are on the border with a grain field which happens to be uphill. Those particular neighbors are better than others about plowing more soil downhill on top of the fence but there's still a nice cliff between the edge of their field and the old fence. We are working with our landlord to be allowed to build a new fence for that section on top of the field. We just only have room for so many projects each year. That all aside, the Jacobs or rather a few particular escape artists, have figured out the easiest sections to climb through. The easiest fix? grab one of our small panel sections, climb the pasture hillside, attach the panel section over the wooly area of fence. Firstly, a huge thank you to all the folks who helped us out in the wake of our barn fire! Many of our neighbors dropped off anywhere from a few bales to a pretty good sized stack to help us through the short term and we've been sent many names and numbers of folks who may have hay for sale. Others have sent money towards a hay fund or offered to pay balances for CSAs that aren't due until March to help keep us liquid while getting ourselves put back together. The folks at Wilson Banner Ranch rallied the whole clan and then some with about 120 bales of straw in about 5 trucks to come up the evening after our barn burned to construct some straw bale and cattle panel hoophouses to shelter our homeless sheep and piglets! We are ever so grateful for all of the family and friends who have offered their help and assistance during this time. This Weekend, February 15th, Omache Farm will be at Artfully Yours Bakery on Main Street in downtown Pullman for another mid-winter sale. We will be there between 11 am and 2 pm along with Wilson Banner Ranch! Wilson Banner Ranch has promised pears and apples, honey and fresh eggs. Yum! Come on over, say hi to some of your local farmers, snag yourself some pork and apples and enjoy something gluten and allergen free from Artfully Yours with your neighbor! Our sheep barn burned down this morning. Pictures below plus more can be found at the Facebook Photos link above. All the creatures got out. and are fine. We got there early enough to shoo the piglets out and Jason had to pull Missy the goat's head out of a fence and grab her kid but everyone is out and fine. If anyone has a little extra hay, please let us know! We can pay for it. Small squares are best: we don't have the equipment to move large squares or rounds. We've been using about 4-6 bales per day.